Select 1 Warrior-Type monster in your Graveyard and return it to your hand. This is definitely not a bad card. The only reason why I don't see it getting alot of play is because of the space issue. Overall, Calling Reinforcements is a much more versatile card. Not only do you have a wider variety of Warriors to search for, but you also don't need to have Warriors in your discard pile for it to be effective. You could probably go one/one Calling Reinforcements/The Warrior Returning alive, but too many more copies of both will disable you from running better cards in its place. Make sure you run a solid amount of Warriors in your deck. Not using enough will shut down the playability of this card immensely. Well, this card certainly has its uses. You can bring back a needed GAF to take down a beatstick, Marauding Captain for more swarming fun, Exiled Force to get rid of a big, nasty monster, etc. I used to play 1 in my Warrior deck, and the only problem I had with it was drawing it in the opening hand, and even then it wasn't hard to get a Warrior to the graveyard and use this card's effect. 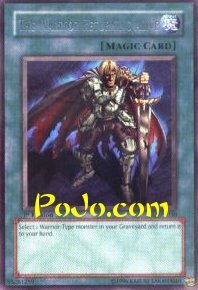 While Reinforcement of the Army searches in your deck, The Warrior Returning Alive searches your graveyard. Niftyness.